"It's every child's duty to survive her parents. My profession isn't a safe one. I would like - Kestrel when I die, do not mourn me." She smiled. "You do not command me," she said, and kissed his cheek. Arin lifted his face so that she could see his expression. A rich emotion played across his features, offered itself, and asked to be called by its name. She always wondered why slaves brought punishment upon themselves. But it has been sweet to feel a tipping of power, however slight, when that hand had cracked across her face. To know, despite the pain, that for a moment, Kestrel had been the one in control. I'm not going to lie, I was nervous about reading The Winner's Curse. I hard such amazing things about the novel and many, if not all, of my blogging friends raved about the book. You can't blame me for worrying. What if it was over hyped? What is I would have enjoyed it more than I did but couldn't because all these reviews over talked the book? I worried for nothing. Marie wrote an amazing book. The world she creates is realistic and I can honestly see it as something that could have happened. Years ago, the Valorians waged war and conquered the Herranis, murdering many of the nobles and turning the population into slaves. By pure coincidence, Kestrel, daughter of the Valorian general, buys the Herrani slave Arin. Over the course of a the next few months, Kestrel and Arin slowly become closer and closer in one of the best "star crossed" slow burn relationships I have ever read. The desire to be together, but circumstances of their lives, create just the perfect romance subplot. Every moment they were together and I just wanted to lock them in a room and smash their faces together. Kestrel is such a strong heroine. She is the daughter of the general and very revived through out the Valorians, think of it as almost royalty, but doesn't allow that to dictate her personalty. She is smart, courageous, determined, and has a soft spot for music. Also, definitely one of the more clever characters I've had the pleasure of reading. She doesn't want to join the military, despite her father's encouragement to do so nor does she want to be married at. However, in her culture women must either join the military or marry by twenty. Arin was a little harder for me to pinpoint, but part of me thinks that might have been intentional. We don't spend as much time in his head as we do Kestrel's and the time that we do we still don't find everything out about it. It isn't until later in the novel that we fully realize the extent of who Arin is. And I love him. I love when novels keep me guessing and introduce me to worlds unknown. 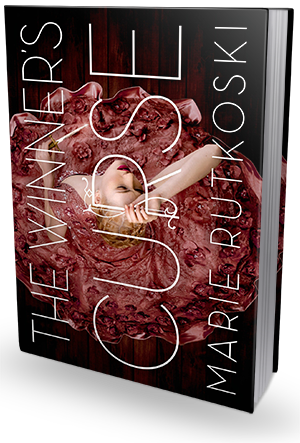 I love that The Winner's Curse is unlike any book I've read before. The writing is superb, the plot excellent, and the character's realistic. Simply book, I found it fascinating and I need more.